Just three years ago Geelong and the Barwon region took up the mantle and hosted the first Geelong Sustainable Living Festival, coordinated by Future Proofing Geelong, regional councils and local community groups such as Geelong Sustainability Group. The first year the Geelong region hosted just over forty events over a two week period and community loved it. It gave the region a chance to shine in the knowledge and local expertise as well as international experts such as Andrew Howard of Team Better Block. In the second year there were more events with over sixty events held in the region and visits by Costa Georgiadis of Gardening Australia amongst others. Through a series of school visits and community gardens showcased this built a sense of pride in regional sustainability, food and education in the region. So how do you top this? In 2015 the Geelong region hosted more than ninety events over three weeks, with a strong focus on educating our children in schools on living sustainably on the land we live on but also the oceans and waterways with a special in-school education program by Tim Silverwood of ‘Take 3’ and more school and community garden visits with the effervescent Costa Georgiadis! In addition this year saw Geelong West Neighbourhood House and Diversitat come on board with a range of classes from beekeeping in your backyard to cheese making and up-cycling of clothes, as well as the Big Weekend with a two day sustainability expo, free lectures and movies in the Geelong Performing Arts Centre (GPAC). This year there was again a strong focus on local healthy and nutritious foods, gardening and access to food through food swaps, local farmers produce and the food hub study with community groups and organisations across the region providing events. The festival culminated with two new highlights the Inaugural Green Carpet Awards and a sustainable seafood dinner held with regional community, Surf Coast Shire and City of Greater Geelong. Held in the courtyard at GPAC on the friday evening and hosted by Costa Georgiadis (yes he was everywhere!) local community celebrated the region with a series of ten awards for sustainability actions, leadership and participation with Future Proofing Geelong. This was a great addition to the annual program and one we hope continues! The sustainable seafood project by the Surf Coast Shire was highlighted at the final dinner jointly sponsored by the Surf Coast Shire and Future Proofing Geelong, City of Greater Geelong. 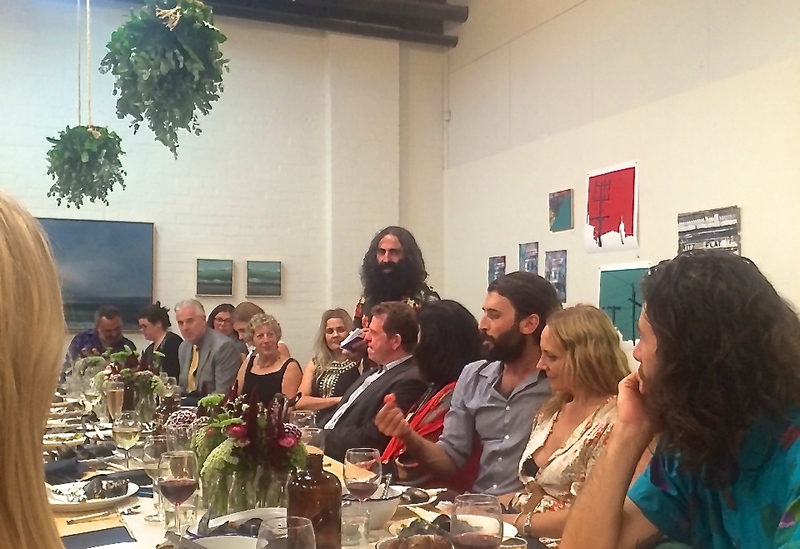 The dinner held at Boom Gallery, was opened by the Surf Coast Mayor Cr Margot Smith and Cr Andy Richards, of Greater Geelong with a special talk by Richard Webb, fisherman and chef working with the Australian Marine Conservation Society. This was followed by a talk by Costa Georgiadis on the importance of resilient longterm healthy food supplies and the importance of understanding the variance in regional food supplies. A brilliant final dinner to end the SLF Geelong 2015. Can’t wait for next year! The Sustainable Living Festival, Victoria is held in February each year (since 1998). It mobilises not just the city of Melbourne but regional towns and cities throughout Victoria. It champions activities by the community for the community and so has moved in tune with the growing awareness and understanding of the need to live more sustainably, in our homes, our food, our transport and more. The Tasmania Sustainable Living Festival an annual event in November has been running since the first Environmental Home Expo (Festival) was held in 1999 and has grown from strength to strength annually since then. Know you farmer, Know your pork!